Freedom from the phone. Freedom from the wires. You’ve eliminated the phone, now remove the wires. 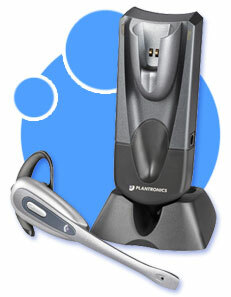 The CS50-USB from Plantronics extends wireless freedom to your softphone. It’s the first wireless headset for VoIP applications with remote call detection and answer/end capability. Experience superior sound quality, stylish design, four comfortable wearing options, and hands-free convenience via your USB port. A complete wireless VoIP softphone solution that quickly connects to your USB port, allowing you to take conversations up to 200 feet from your PC with no headset cables. The CS50-USB is the first wireless headset with remote ring detection and call answer/end at the touch of a button, thanks to Plantronics’ PerSonoCall™ software. Quickly converts for your choice of four comfortable wearing styles, two that are included— over the head and over the ear; and two that are options—behind the neck and dual T-pad headband. Streamlined one-touch volume control, mute button, and call answer/end for complete control while you’re away from your desk.